As the majoy specification for almost all recent digital display devices, the high definition video is widely used nowadays. While in the old days, our media entertainment resolution is mainly 480p or 720p. Not clear the difference between 1080p, 720p and 480p and often come the needs to compress the high definition 1080p to the lower defintion video 720p or 480p, you can find helpful answer in the following parts. Part 1: What’t the difference between 1080p and 720p, 480p? Part 2: Why need to convert 1080p to 720p, 480p? The “p” stands for “progressive scan”, progressive scan is the type of video a computer display uses, repainting the whole screen each frame. The 480p was used for many early Plasma televisions. Standard definition has always been a 4:3 aspect ratio with a pixel resolution of 640 × 480 pixels.720p (1280×720 px; also called HD Ready) is a progressive HDTV signal format with 720 horizontal lines and an aspect ratio (AR) of 16:9, normally known as widescreen HDTV (1.78:1). While 1080p (1920×1080 px; also known as Full HD or FHD and BT.709) is a set of HDTV high-definition video modes characterized by 1080 horizontal lines of vertical resolution and progressive scan. The mainly reason why we need to convert 1080p to 720p or 480p is that 1080p is not supported by old devices as they have limited storage capacity but with increased display resolution and hence videos demand more space for storage. Apart from that, almost all latest videos are uploaded with full HD content on internet and our old cell phones does not have the capability to access them. Thus it becomes necessary to convert 1080p into either 720p or 480p so that we can watch our favorite videos easily on your old device. – Support the new Windows 10 and macOS Sierra platform. Based on above listed standard, we have pick the following 5 best 1080p to 720p/480p converter for you. Pavtube Video Converter Ultimate has full support for 1080p media types include 1080p Blu-ray disc, HD DVD and 1080p digital video with the format of AVCHD MTS/M2TS, MXF, XAVC, XAVC S, Tivo, H.264, H.265, TOD, MOD, etc. You can convert 1080p to 720p and 480p video with various popular file formats and even hot device preset profile formats. To get the best playback effects on the old device, you can use the program to flexibly adjust output video aspect ratio let it fit with your device’s display screen aspect ratio. If your video is too large, you can save more space for you old mobile device by trimming unwanted parts from the video or split the large video into small clips by file size, count or length. 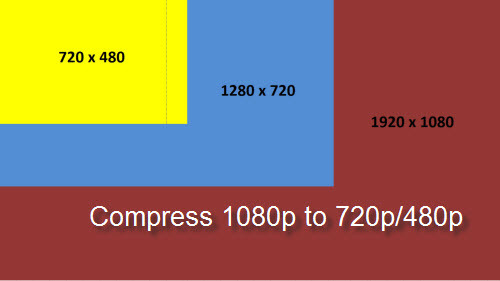 Besides compressing 1080p to 720p/480p, you can also use this program to compress 4k to 1080p. Pavtube Video Converter for Windows/Mac is another top ranked 1080p to 720p/480p video converter program.Different from Pavtube Video Converter Ultimate, it lacks the ability to handle 1080p Blu-ray or HD DVD disc. It also has full capability to handle all 1080p file formats and downscale 1080p to 720p/480p video with various different file formats. The built-in video customization function and full editing package can do you a great favor to compress 1080p to 720p/480p to your desired video with the best results. With Free HD Video Converter, you can enjoy HD videos anywhere. As a remarkable 1080p video converter, Free HD Video Converter allows you to convert HD video to many popular 720p or 480p file formats, like AVCHD to AVI, MOD/TOD to MP4, MTS/M2TS to MKV, etc. Advanced in supporting HD video with 720p, 1080p resolution and above. Leawo HD Video Converter is remarked as a high definition video converter designed to convert common and HD videos to many popular formats like AVCHD to AVI, MOD to AVI, MTS to AVI, MTS to MOV, M2TS to AVI, M2TS to MKV, M2TS to MP4, etc with zero quality loss. All the 1080p to 720p/480p converter listed above has its own pros and cons. However, if you are looking for a powerful, faster, stable and reliable program that allows you to convert 1080p to 720p with best quality.We highly ranked Pavtube Video Converter Ultimate for Windows/Mac. As a cross platfrom program, the program keeps constant with perfect support for the new Windows 10 and macOS Sierra. It features a simple and clean GUI Interface, you can easily complete the whole conversion process without additional document illustration. In addition, it is very stable and there are no sudden crashes. What’s more, you can get free lifetime upgrade with support all the time.